⇒ Automated data preparation – apply a template to analyze each measurement in a population automatically and generate one analysis document per measurement containing all of the parameters for statistical analysis. 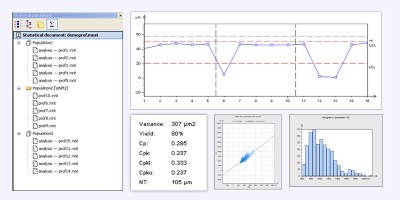 ⇒ Multiple populations – define multiple populations for statistical analysis by simply selecting the analysis documents corresponding to each measurement population or by specifying the folder where they are located – calculate statistics for one or more populations including dimensions (distances, areas, volumes, step heights, angles) and parameters (e.g. ISO 4287 or ISO 25178 parameters). ⇒ Dynamic and static populations – declare whether a population is static (all measurements are done) or dynamic (measurements are ongoing) – new measurements in a dynamic population are analyzed automatically and statistics are refreshed to take new data into account. ⇒ Control your process – display control charts for an instant picture of whether or not a parameter is out of limits, together with histograms, box plots and scatter plots. ⇒ Evaluate manufacturing system capability – calculate capability parameters (Cp, Cpk, Cpkl, NT and ET) to evaluate the capability of the manufacturing system to repeat itself. ⇒ Data export – export results to quality management systems in Excel-compatible format.